Welcome to Part III of my exclusive interview with Family Feud Executive Producer Pam Barnes. And today, Pam tells you Everything you Always Wanted To Know About Auditioning For Family Feud (But Were Afraid To Ask)…. PB: The way we do auditions for Family Feud is we ask people to come along at 9 o’clock on a Saturday or Sunday. We explain to them ahead of time that they have to commit the best part of their day to us if they want to appear on the show. It’s a two-step process. 9 o’clock in the morning they come in, we give them a registration form, which they all fill out, then we play some games, we do some surveys and then we interview each family. SH: That’s four people, isn’t it? PB: Some people come along with five or six, which is not a bad idea sometimes, so we can say “leave Fred” at home”, or in case someone is not available when we book them in. SH: (LAUGHING) Gee whiz – brutal! SH: Do people do audition in groups of four? Not as individual people? PB: They audition as a family of four, not as individual people. We have found the best families are the close families because they think alike or they know how the others think, so they interact with each other better. It’s fun! Russell Fletcher* conducts the audition and he is very funny. He brings so much out of the people and everyone has a great time. After we (the producers) have interviewed everybody – I ask them to tell me about themselves, what they do for a living, etcetera – we then assess each family as to their understanding of, and ability to play, the game. If they can’t play the game at that very first chat at the desk, then they don’t get the callback for the afternoon. SH: Because they haven’t listened to instructions. PB: Yes, that’s right. Because we’ve already said “we don’t want to hear this” and “we don’t want you to do that”. Then in the afternoon, we actually play a game with family versus family, and that’s where their real playing ability comes out. Each family gets to play two questions against each other. Russell plays the part of Grant (Denyer, the show’s host). He goes down the line and talks to people, and everyone leaves at about 3:30 or 4:00, saying “I had the best day”. They have some fun. It’s a day out, it’s like an improvised comedy day. Everyone loves it. SH: How often do you audition? PB: A lot! Last weekend, we did Saturday and Sunday. We audition around the country. We use more from Melbourne – purely because this is where the show is made – but we have interviewed and auditioned in Sydney, Brisbane, Adelaide and Perth. We have someone from those cities every record. SH: What do you, or your production staff, tell your contestants just before they go on set? PB: When they come on record day, we actually play a practice game in the studio. Russell again plays the role of Grant and we have the Barnes family over here and the Hall family over here and we play a couple of questions so that they get a sense of how it works and know the geography of the set and where to walk… and we also rehearse them on where to stand for Fast Money, who’s playing first, where they stand, who’s playing second. This is on the actual set. We brief them on trying to avoid saying everything that everyone says over and over again. I don’t know if we are ever going to remove some of the language. SH: Can you give me an example? SH: Apart from those words and phrases, is there any other things that people should bear in mind in case they want to audition? PB: Probably not be too smart. SH: How do you mean? Like “smart aleck”? Don’t try to be funnier than the host? PB: Don’t try to be funnier than you are. Don’t try to tell the producers how to produce the show. SH: Really? Has that happened? Yep, don’t tell the producers how to do their job. Staggering that some people would try to do that, isn’t it? But there you go. It turns out that watching a TV show doesn’t necessarily make you an expert on how to make that TV show… Who’da thought? Anyway, after all that talk of auditioning for Family Feud, if you’re in Australia, and you are interested in taking the plunge, your first stop is to click here... Survey says Good Luck! * Russell Fletcher is an actor, improviser, and director. and a good and colleague of mine. In the interests of full disclosure. 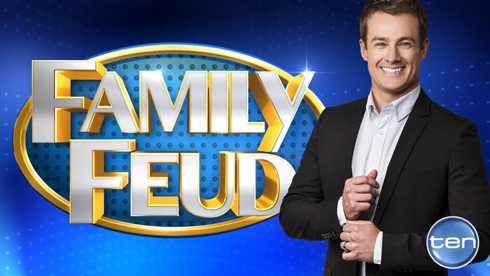 Advertised on Channel 10 Adelaide TV Fri 31st July 2015 for auditions for family feud adelaide….cant find details on family feud sites…..help plz……we want to be on family feud! I’ve asked a friend who works on the show about this, and am waiting to hear back. In the meantime, I just had a look at the FF Facebook page – https://www.facebook.com/FamilyFeudAU – and according to them, “Due to the overwhelming amount of love we’ve felt from families around the country, applications are currently closed. We’ll be sure to let everyone know when they reopen.”, and that was posted on 27 July. So maybe you should ‘like’ their Facebook page, and keep checking back there? Deborah, I know it’s been a long time since your comment here, but I spotted this this morning, and had to share it with you.